You put together a killer combination of clothes one day last week and everyone complimented you. But what shoes were you wearing? And oh god, does this shirt need a necklace? And what if it's raining? 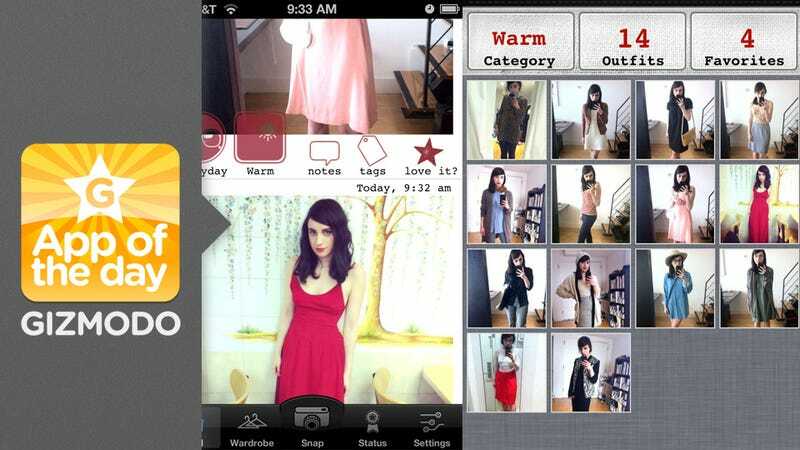 All those questions can be answered with the rebooted version of a fashion app called Cloth. It lets you save and organize your outfits, and it uses weather data to automatically tag them with the current conditions. Is it a scorcher like today? You can pull up a whole selections or sun dresses and sandals or bermuda shorts and tanks perfect for a balmy day. This app has been around for a while, but it was pulled from the App Store to add weather info from Wunderground. And the new version is something very unique. Aside from that new weather feature, it's also got photo editing tools from Aviary, so the pics you add of yourself all gussied up in seasonally-appropriate couture look just the way you want them to.